Note: Thanks for taking part in the promotion! This offer is no longer available, but you can still join us onÂ SitePoint Premium. GetÂ accessÂ to all our ebooks, courses and screencasts and web development and design for just $99/year. One FREE year of SitePoint Premium.Â This includesÂ unlimited downloads of 82 ebooks, 66 courses and over 180+ screencastsÂ on web development and design. Unlimited public and private repositories at Bitbucket to host the personal and professional projects you’re building, completely free. The whole process takes less than two minutes and thereâ€™s no credit card required! Click here to create your free Bitbucket account. 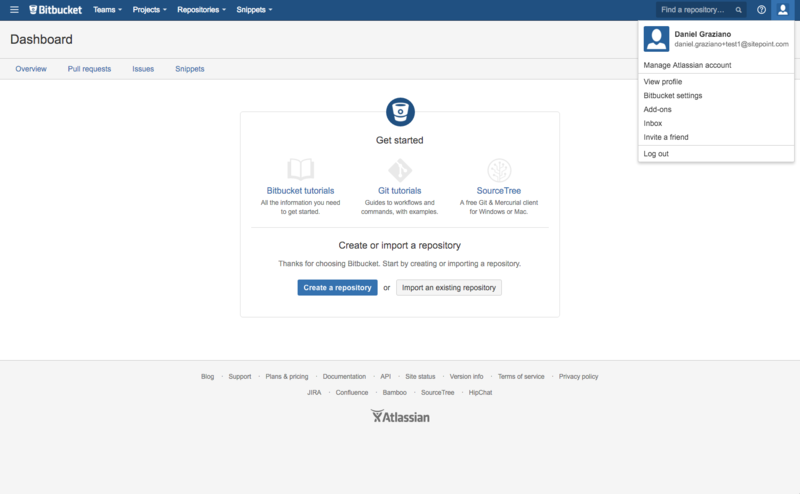 Complete the account creation process andÂ check your inbox for a verification email fromÂ Atlassian. Hit â€˜continueâ€™ and youâ€™ll be taken to your dashboard. Email your screenshot to bitbucket@sitepoint.comÂ – you will be sent a coupon to redeem yourÂ free year of SitePoint Premium once we verify the screenshot. ExampleÂ –Â This is what your final screenshot should look like. Current SitePoint Premium members are also eligible â€” theyâ€™ll receive a one-year extension of their membership.